"The Recruit" is a pretty basic two-part opener that shows Kaz getting in over his head, struggling to fit into the new life he's chosen for himself, and proving himself by simply surviving the dangerous race. The literal Neeku Vozo (Josh Brener) feels more than a bit like Disney trying to steal some thunder from Drax the Destroyer and Marvel, but proves necessary to get the ball rolling. While the racing backdrop offers some interest, hopefully the show will be more geared to Kaz's true mission of learning about the First Order and their movements in the Outer Rim. 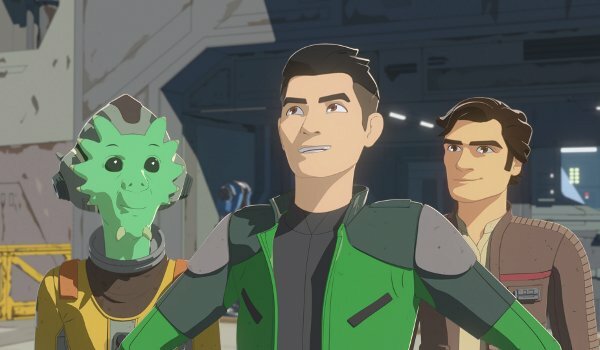 The episode's intro and ending offer us a look talented TIE pilot Elrik Vonreg (Lex Lang) who I'm guessing will have a larger role as the series moves forward.